Angels and Demons, Myths and Legends. It's been six months since Reginald Baskin became a vampire too fat to live happily with the beautiful undead — six months in which Reginald and his two-thousand-year-old maker Maurice have learned that safety does not come with power. These days, Maurice is Deacon of the Vampire Nation, but plenty beneath Maurice are still plotting to depose him … or dispose of him. But when a new and ancient threat rears its head, the Nation faces extinction and the truest of deaths — and Reginald, Maurice, and Nikki might be the only vampires able to stop it. This sequel to the cult hit picks up where Fat Vampire left off, following a trio of unlikely heroes down a path of myth and superstition into truths that have lied buried for centuries — pitting the world’s darkness against the unfathomable power of its angry creators. 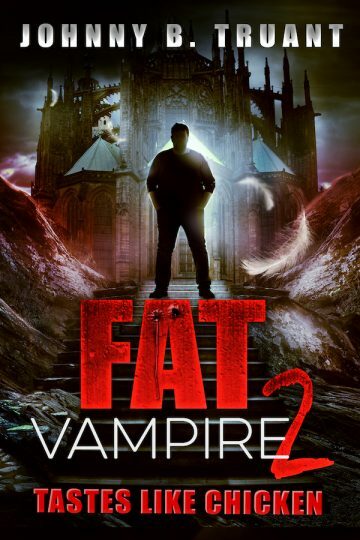 This fresh twist on the tired old undead myth is the second in the Fat Vampire series by Johnny B. Truant — author of many bestselling series including Invasion, The Beam, Unicorn Western, The Dream Engine, Robot Proletariat, and more.